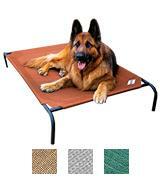 Elevated bed for big dogs. Yes or now? Hi,all! I was choosing the dog bed and found this elevated bed. There is the German shepherd on it on the picture. Who knows, can such a bed stand the weight of such a big dog?